Have you ever given lard a second thought? I sure hadn’t. It sounds gross and isn’t good for you, that’s all I needed to know………or so I thought. I was to make pecan pies for the Thanksgiving dinner at work and decided to make them from scratch (something I’ve only done once about 13 years ago). Well, I was reading some things on the web and found where a woman was talking about lard being a good. As I read she said that it is lower in cholesterol than butter…….no way. So I googled it, you know what? It is! 1/3 the cholesterol compared to the same amount of butter. I also found some information that said that many chefs prefer lard but do not use it because of pork being prohibited from some diets for religious reasons. HMMMM, this made me think that I needed to give this a try, and my pie crusts would be a great place to start. I bought the lard which comes in a small bucket and is found with the shortening & oils for those that don’t know (I thought it was with the butter). I have to say, lard is not pleasant smelling. The odor is not strong so it didn’t really bother me though. I will post the recipe at the end of my post, it is super simple. The dough worked up really nice and clean up was so much easier. Usually when you roll out something that uses butter or crisco, it smears across the table when you try to clean it up, this didn’t do that at all. Butter or shortening is usually really hard to wash off your hands, this is not. If you have to roll out something that uses butter or shortening it sticks really bad and you have to use a lot of flour, this did not. My hands were also very soft when I finished, and I have cronic dry hands. This made me wonder if women that always used lard had soft hands from using it. The baked results? The crusts baked beautifully, they didn’t seem to brown as quickly as other pie crusts that I’ve used. Therefore I didn’t have to cover my crusts to keep them from burning. I baked my Pecan Pies for 1 hour and the crusts were the most beautiful medium brown color and so flakey. This is how will be doing my crusts in the future. I also stuck one in the freezer to see how well that works. I really enjoy things like this, makes me feel connected to women who did things so much simpler. Like I’m connecting with my grandmother and other women in my family that would have done things this way. I don’t mean that in a weird cosmic way, but in a way of this is how it should be. We so often discredit the ways of older women and women of our past in today’s culture, “that’s too old fashoned”….”this way is faster or better”. Maybe we should be learning from them like God instructs in Titus 2. They have much to teach on spiritual issues as well as everyday living. I know in this day it is not considered healthy to use animal fats in our diet. This is a recipe that my grandmother used for as long as I can remember. The lard was usually freshly rendered from butchering, the stove was an old monarch wood, and the fruit inside the pie was usually home grown and canned by her. She also took first prize every time she entered them in the fair. She just left us this year at the age of 100, and not from heart disease. I use this crust when I want to impress company with a pie. Mix flour and salt in a bowl. Cut in lard with pastry blender until small pea size particles are obtained. Sprinkle with water a little at a time. Mix with fork until flour is moist. Press into a ball and turn out onto a floured board. If making a two crust pie divide in half. Roll out with rolling pin. Try not to use too much extra flour because it makes the crust tough. Roll out to desired size. Usually about 1 inch bigger around than the tin. Fold pastry in half and move up to pan. Unfold and put pastry into pan. Try not to stretch the pastry because this causes shrinking in baking. Sprinkle the top crust with a little sugar to evenly brown. A lot has been going on lately. Not near enough time to play on the computer. Have you ever cooked your own pumpkin? 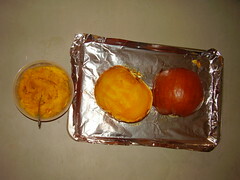 I had never cooked a pumpkin before, the one in the picture above was my first. One thing I learned, pumpkins are very hard to cut, hubby had to cut it for me. This will not be my last, I enjoyed getting pumpkin from a pumpkin instead of a can. I made a crustless Chocolate Pumpkin Pie, it was really yummy. If you are not familiar with Revive Our Hearts, jump over here and check it out. This ministry has been such a blessing to me lately. I listen to the programs in the morning when I’m getting ready and sometimes on the weekends when I’m piddling around the house. They have an archive of great messages, I highly recommend the Esther and Rahab. A few weeks ago there was a conference in Chicago, True Woman ’08, I wanted to go to it so bad but wasn’t able to. The great thing is that you can listen to the speakers online. John Piper’s message on The Ultimate Meaning of True Womanhood is really good. I haven’t listened to all of the messages, but you can find them here. They also have 30 Day Challenges, I am currently doing the 30 Day Husband Encouragement Challenge. I’m only on day 2 so far. I pray this will be a blessing to my hubby. What a wonderful God we serve, I am so excited about what He is teaching me lately. I am really learning to watch my tongue. I think it was about 2 years ago that I focused on the for a type of new years resolution…….well it’s here again. I was listening to the study on Revive Our Hearts, God’s Beautiful Design for Women, Living Our Titus 2:1-5. The program is titled Your Words Reveal Your Heart, there was one thing that she said that has really stuck with me (not that there wasn’t a lot that was good). Titus 2:3 says “The aged women likewise, that [they be] in behaviour as becometh holiness, not false accusers, not given to much wine, teachers of good things” We are to be cultivating these things so that when we are an older woman, we exhibit these things. We should be exhibiting these things now, before we become older women. The thing that hit me like a ton of brick is “false accusers”, if you look that up in the Greek, the word is ‘diabolos’, the word for satan! When I say something about someone that is unflattering, I am being like satan. How many times do we try to excuse something we say because the someone we are saying it about has wronged us? I’m ashamed to say I’m guilty. God has really been holding my tongue so that I think about this before I speak lately. Our tongues are a powerful thing. What a convicting thing to be reminded that when I do not take control of it, I am being like satan. I hope you will check out some of the above links and that this ministry will be a blessing to you as it is to me. Lately my relationship with God has blossomed in ways that I have never experienced. We don’t get any TV channels, this is by choice. We could have an antenna and pick up the local channels or have satellite but choose not to have these things. At one time we had SkyAngel and really liked it but chose to cancel it so that we could put that money toward buying Christian movies that were of interest to us. We rent movies or watch what we have bought instead of regular TV channels. We chose to do this because so much of the stuff on TV today is immoral and vulgar and even sacrilegious. Now don’t think I’m judging those that watch TV, that is your own personal business, I am sharing our conviction. Now renting movies you can get into the same types of thing if you aren’t careful, and believe me we did. Sometimes it was by accident and sometimes because we would justify it. A couple of months ago we decided that we would not rent any movies that are rated R and to be extremely cautious of PG-13. It’s not that all movies that are rated R are bad, The Passion of the Christ is rated R (this is one of the only ones I can think of that we would make an exception). Let me tell you, it has changed our lives! I know if seems like such a small harmless thing, but I can’t even begin to explain the difference it has made. I honestly believe that things like that carry a spirit, and if the movie is not wholesome, neither is the spirit that comes with it. I believe that Satan has used things like this to penetrate our mind so that the things of God are not as desirable to us. I have had a hunger for God’s Word like I haven’t had since I first got saved 15 years ago. I feel like what I have is an actual relationship with God for probably the first time in my life. I am learning to trust Him with things that before I would say I was trying to trust Him with, but nothing was moving forward towards experiencing the peace of that trust. No, I wasn’t lying, but is was only verbal, nothing more. I say all of this not to say, look at me, but to challenge anyone reading this. I’m not saying you must do what I did, but look at your life and see if there is anything that you have been hanging onto that you need to purge. My relationship with God is not perfect now, but I feel now that I am moving forward instead of in reverse. Last week Aldi had strawberries on sale for $0.99 lb! I bought 12! My hubby and I ate a bunch of them and I made jelly. I made 3 jars of freezer jam which is not cooked and tastes more fresh, they are the lighter colored ones. 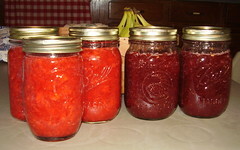 I also made cooked jam which is more like what you buy at the store, this picture is only 2 of the 4 jars. All of the jam is made from lower sugar recipes. I was really excited about the cooked jam because I didn’t use any pectin, only strawberries, lemon juice and sugar. I love making things like that, like they could have made it 200 years ago. Know what I mean. I like convenience foods, but love to know that I can do something like this. I will Lord willing post more tomorrow on my lunch hour, I didn’t get to today. So much to write! This post should have proceeded the post below it. I had it saved and forgot to post it. We were able to go to Indiana the weekend before New Year’s Eve. It was an interesting trip, all of which I will not get into here. I got to actually spend a bit of time talking with my new sister-in-law, my brother picked a good one. She is so great with his kids, firm but loving – and has patience, something 6 year old Jenna needs lots of with all her energy. My biggest concern is where they are spiritually. I have to keep praying. I know God can take care of all their problems, they just have to realize it. While I was in Indiana, Jake & I were able to spend the better part of a day just the two of us. It was really nice, we don’t get that because there are so many other things that take out attention & time while we are there visiting. There are other people I had wanted to visit while I was there, but I didn’t want to give up that priceless time with Jake. He’s been having a hard time lately, burdened with a lot of things which a 10 year old shouldn’t be burdened. I think that time was good for both of us. We went out to lunch and were going to go see National Treasure 2 but missed the movie. We went to the Coffee Junkiez and then met my mom at her new office where she had floor duty (she’s a Real Estate Agent). She gave us a tour of the building, it’s huge!!! They have a gym, an auditorium, their own flower shop, a massage therapist office, a mortgage company and more I can’t even remember. We hung out there talking to mom, she has to be in the office in case anyone calls in with questions, until time for her to leave. It was a nice trip, I miss my family in Indiana. Lately I have been really homesick, more so than I have been since I first moved here. When I first moved to Georgia it was really hard, I didn’t know anyone but my husband and mother-in-law. I didn’t get along great with my mother-in-law then, we get along great now. I wasn’t working and I had way too much time on my hands that I was not good at occupying productively. I would sit and feel sorry for myself I’m ashamed to say. 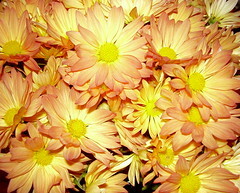 Now though, I have a job I love, I actually know people here, I get along with my mother-in-law, but I couldn’t fight it. The holidays are hard because I want to do things with my mom and can’t, and want to be around my family up there too. It did make me do some baking, more than I’ve done all at once since I’ve lived at this house (I have a small kitchen). I finally woke up one day and realized that my feelings were from not being content. I know it’s obvious, but I didn’t see it. That started my journey. My depression if you want to call it started about late October, I have finally in the last couple of weeks started to be content. More on that later. Last year my word for the year was Tongue. Instead of a New Year’s resolution I took an idea that I read to take a word that describes something you want to work on and put it everywhere as a reminder. I still need daily work on last year’s word, but I think it was very beneficial. I also had people that would ask when they saw my word what it meant. When they learned what it was, some would hold me accountable and remind me. This year my word is CONTENT and my verse is Philipians 4:11-13. I have found that singing and repeating scripture has really helped me. Too often I become discontented with what I have lately. The people I work with are in a much higher income level than we are, that has been really hard for me at times. Their attitude about things is different because they have the money to back it up. Also, I look at lots of houses that are for sale every day with the job that I do and it can make me very discontented with my own house. I am thankful to have a home, or at least I thought I was. I’m not so sure I appreciated my home as much as I thought I did. For instance, the kitchen is the most important room to me. I like to cook, but I want plenty of room. Our kitchen is very small, I’ve become discontented with it, always wanting for a bigger kitchen. There is nothing wrong with me wanting a bigger kitchen, but it kinda got to the point where I wasn’t wanting to cook because I don’t have as much room as I want. Then put that with seeing pictures of dream kitchens in houses that we cannot afford, I became very discontented. Another thing that I’ve struggled with contentment is where I physically am. Not my appearance, my location. I want to be with my family in Indiana and feel like they need me too. Holiday’s are the worst, that is always a struggle -but this year was worse. I was already discontented so that just added fuel to the flames. I am where God needs me to be. I have what God wants me to have. Moving, having more money, a bigger house, a bigger kitchen, those things will not make me happy. If I do not deal with my discontentment, if I ever get those things I will still be discontent because there will always be something else. I am more content than I have been in years thanks to God. He has really grabbed a hold of me. No, I am not content every second of every day……it is a minute by minute and day by day decision not to wallow in discontentment. I was telling my husband the other day that I have come to the conclusion that I will never get to the point where I am always content. My journey is not about finding contentment, but finding what things bring me back to the place of contentment. There will always be things around me that could take away my contentment. My journey is seeking God to show me the weapons I can use to battle or ward off that discontentment before it grabs hold of me. Scripture and hymns are the things God has shown me, they do me no good unless I choose to use them. I posted this at Monica’s blog in response to a recipe exchange and thought I’d share here too. This is my family’s favorite Chocolate Chip Cookie recipe. My step-daughter even asked me to bake these for her friends for Christmas one year. This is a recipe I have tweaked and made it my own. I got an idea to use ground oatmeal to replace some of the flour because my family doesn’t like wheat flour and my step-daughter doesn’t like the texture of oatmeal. I just grind regular oatmeal and keep the extra in a baggy. I love this recipe because you don’t have to use a mixer, it’s easy to mix by hand. Combine Flour and baking soda. Set aside. In a large bowl, combine melted margarine and brown sugar. Mix well. Stir in egg and vanilla until well blended. Add flour mixture and stir until just combined. Stir in chocolate chips. Drop spoonfuls on cookie sheet. I put about 6 per sheet because they spread. Bake at 350 for about 10 minutes for a chewy cookie, center will still be soft. I leave some in there a bit longer and brown them good because my husband likes them crunchy. This makes a smaller batch than most recipes, sometimes I double it. Last Friday we had our company Christmas Party at the Sheraton Hotel. Heather said I could borrow her camera and I talked myself out of taking it, a decision I regretted as soon as I walked in the building. It was gorgeous! 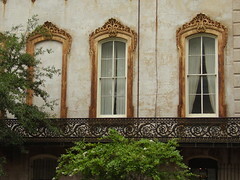 Our party was on the 2nd floor, where we had an absolutely delicious dinner – the food was amazing. The shrimp were bigger than any I think I’ve ever seen. The band was good, they are from Atlanta but I don’t remember their name. One thing that really cracked me up was the name tags. If you didn’t bring your company name tag (and most didn’t) they gave you a big sticker one the size of a credit card. Here are people coming in with fancy expensive dresses and tuxes and they give them a big sticker to stick on it. They had a Dancing with the Stars contest with each office represented but ours. We had someone that was going to dance, but her partner’s father-in-law passed away that morning. The dancing was funny, one couple was dressed as Santa & an elf. I ate and talked with the people at my table a bit and watched the first round of dancing before leaving. It was a nice experience, but I felt so awkward. I don’t drink alcohol, everyone at my table was drinking. I don’t dance. It was hard to talk over the music. The whole thing was all just a little too swanky for me. Don’t get me wrong, I’m not complaining. I appreciate what the company did, it’s just not my bag of tea. I’m glad I went, but I don’t regret leaving early either. I’ve been doing a lot of stitching. I have some special things I’m working on that are hush, hush. 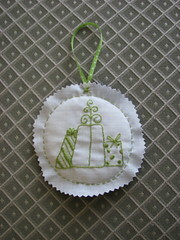 This picture is of an ornament I did for a swap. I’ve also been doing some baking. I’ve been in more of a mood to bake than I’ve been in a long time. Last week we had our office Christmas dinner and White Elephant gift exchange. I ended up with a beautiful Reindeer sculpture. I took Apple Dumplings for the dinner, my grandma’s recipe. When I was deciding what to take, I came across an Apple Dumpling recipe and it made me think of how good my grandma’s used to taste. I called and kinda got the recipe from my mom. It’s one of those “take some flour, a handful of sugar (which I forgot), add some shortening until it’s crumbly, and add ice water until it gets to where you can handle the dough.” That’s how my grandma cooked, and I have followed in her footsteps……..but I try to measure. Everyone loved them! They were a little different to me because I used Granny Smith apples, I think my grandma used a sweet apple instead of tart. I was very pleased with how they turned out. Thursday Heather left to visit her mother in Oregon. She will be gone until the beginning of January. We opened our gifts last Sunday since she wasn’t going to be here. I don’t like doing that early, but it’s either that or after she gets back. Today was supposed to be a baking day, but I haven’t felt very good. So instead I’ve done some stitching and straightening up around the house. Can you believe that Christmas is just a little over a week away?!? This year sure has gone fast. Look at the wonderful things I received all the way from Australia handmade by Jane! A Beautiful bag that is now holding my current stitching project, a beautiful green scarf and a lovely journal – all handmade. 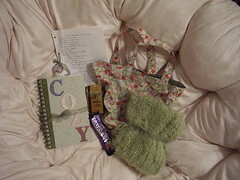 She also included coffee and chocolate as well as a recipe for Christmas Pudding, which I cannot wait to try. I have been meaning to post this, but it has been a crazy week! We are exchanging our gifts on the 9th so I have been trying to get my shopping and such done. I’m pretty much finished with Heather’s, but I still have my hubby, he is so difficult to buy or make things for. Heather is leaving on the 13th for Oregon and will not be back until the first part of January, which is the reason for the early exchange. We have been sick, so our Christmas tree didn’t go up the weekend after Thanksgiving as I had hoped. Yesterday we came home and Heather had the tree up, lights, decorations and all! Today I have some baking to do, my hubby wants me to make him another Pecan Pie and I am going to make some “hard tack” for my nephew. “Hard Tack” is what the Civil War soldiers carried with them for nourishment. It’s basically a hard cracker that they would soften and eat, it would stay good forever. I read one place that some hard tack was said to have been used after being carried by other soldiers 30 years earlier. Yikes!! I also read that the Southern version was made from corn meal, I think that’s what we tried that the reenactor gave us at the battlefield. He is intrigued by stuff like this so that is going to be a part of his Christmas gift. I also have some Christmas ornaments to finish up for a swap. I better get back to it. This picture is of the potted Pelee Mums I got at Aldi yesterday, they were marked down to $1.99 and I just couldn’t resist them. I’m sick today, so I stayed at home instead of going to my mother-in-law’s. Heather went and my hubby is going to stop by after work. I hate that I had to stay home, but I have a lot to be thankful for, so it’s ok. I have a turkey in the freezer, I think I’m going to cook turkey & dressing and such soon. My MIL was planning to cook a turkey breast & ham for sandwiches………no dressing and such this year. That’s how it was last year too. Because of her hip surgery, she cannot stand for long periods of time and doesn’t want to put the cooking off on us. I’m going to talk to her about doing a more traditional Christmas dinner, and we will take on the cooking. I have to admit one of the reasons I want to do it is kinda selfish, I want her to teach me to make her cornbread dressing. :o) Really she could teach me that anytime, but it has been awhile since we have has a big dinner for Christmas or Thanksgiving and I think it’s time……..but it shouldn’t be up to her to do the cooking. I’ve been really homesick lately. It’s probably worse than it’s been since I first moved here. The bad part is, it’s not one of those homesick feelings that a visit would cure, I’m homesick to live near my mom. I just want to be a part of what’s going on there, not just hear about it. I was just thinking yesterday when they were talking about all of the people that are traveling for Thanksgiving, I used to feel so bad for people having to travel this time of year. I was always so thankful not to have to battle all of that at Thanksgiving & Christmas. Now I’m one of those people. I hadn’t thought of that before. Well, I’m not feeling sorry for myself, really I’m not. I want to be with my mom, and I wish I had felt well enough to go to my MIL’s, but at least I’m home. At least at the end of the day I’m with my hubby and step-daughter. There are so many families that are not together this year because a spouse, sibling or child is a soldier that was either killed or deployed and will not be able to be with them. I cannot imagine how hard that must be. Keep them in your prayers, the soldiers and their families.